When it comes to marriage, many marriage-bound singles might take the ages of their future partners under consideration. However, some entertainers seem to believe the ever-widening age gap poses little in the way of an obstacle for their relationships. Here are some of the top entertainers with a wide age gap between them and their spouses. It has been nine years since YG Entertainment’s founder, owner and chief executive Yang Hyun-suk started secretly dating his bridegroom Lee Eun-joo, a former member of the disbanded group Swi.T. 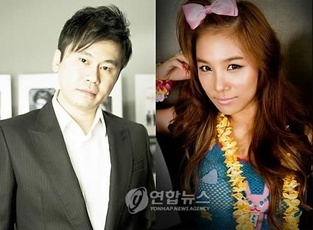 The 39-year-old YG executive said the couple has officially registered their marriage, but do not plan on a ceremony. Actor Jo Yeon-woo, 39, married a woman 16 years his junior on Dec. 15 of last year. In a TV variety show, he confessed that his mother-in-law is just six years his senior. Actor and singer Im Chang-jung, 37, married Kim Hyun-joo, a professional female golfer 11 years his junior on March 19 of this year. Im has fathered two children with Kim, whose due date for their third child is slated next month. He has appeared in a number of movies, including “If the Sun Rises in the West,” “All for Love and “The Greatest Expectation.” In addition to his career as an actor, he is also dedicated to his singing career. Comedian and reality show host Lee Su-geun, 36, is married to Park Ji-yeon, CEO of an online shopping mall selling clothes. Eleven years her senior, Lee has been working on a number of comedy shows, including KBS’ Gag Concert (comedy show) and MBC everyone’s Monarch of the Ring, and has been appearing on several variety shows including “1 Night and 2 Days” broadcast on KBS2 every Sunday. Singer and entertainer Kim Jung-min, 42, got engaged to former J-pop singer and third-generation Korean-Japanese Rumiko Tani on Oct. 21, 2006. The couple, 12 years apart in age, have two sons and no daughters and said they hope to raise one more child. Actor Lee Han-wie married makeup artist Choi Hye-kyung in March 2008. According to his explanation, he encountered his partner when he starred in a historical drama “Immortal Admiral Lee Sun Shin,” aired from 2004 to 2005 on KBS2. Choi is said to be 19 years younger than Lee, whose mother-in-law is allegedly just four years older than he is. Lee has two children with Choi, who gave birth to their second child in March this year. Actor and Korea Art Institute professor Yu Jun-sang, 40, married 29-year-old entertainer Hong Eun-hee, who has frequently shown up in a variety of TV programs, TV commercials and magazines. Yu and Hong have two sons and no daughters. 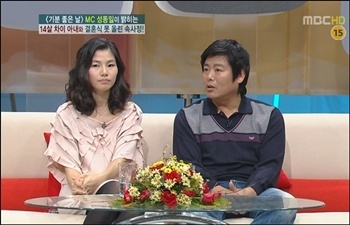 TV host and cleaning agency owner Cho Young-gu, 43, got engaged to TV shopping host Shin Jae-eun, 11 years his junior. Shin gave birth to a son by Cesarean section on May 10, 2008. Cho has been working as a regular panel member in talk shows and morning news broadcasts on SBS. Actor and entertainer Jeong Woong-in married a woman 12 years younger than him on June 3, 2006. The 39-year-old entertainer has appeared on a number of MBC TV dramas, including “The Great Queen Seondeok” and “Coffee House.” The couple currently share two daughters and no sons. Singer-turned-lyricist Joo Young-hoon got engaged to actress and online shopping mall owner Lee Yoon-mi on Oct. 26, 2006. Joo’s wife, 13 years his junior, gave birth to a daughter on March 26 of this year. The 40-year-old made a breakthrough when he switched his career as a lyricist in 1997, reportedly composing more than 300 songs. Sung Dong-ill is an actor renowned for his villain’s role in KBS’ night series “Fugitive Plan B.” The TV veteran admitted that he has been dating with his girlfriend since 2003, 14 years his junior. The daredevil actor said he is happy to officially announce their marriage next month, expressing his heartfelt apology for putting off their marriage for eight years due to his hectic schedules. Comedian-turned-actor Lee Chang-hoon, 45, got engaged with a woman 16 years his junior on Sept. 16, 2008. The couple’s only daughter was born on May 8 of this year. 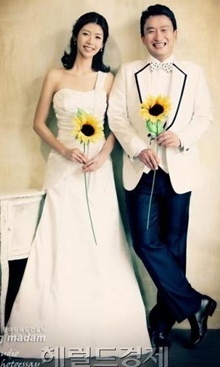 Comedian and TV host Seo Gyung-seok, 38, married a 25-year-old designer on Nov. 11. He later expressed his heartfelt apology to the public for his late engagement with his young bridegroom.